Kivalina, Alaska. Humans have been a part of the Alaskan Arctic coastline for thousands of years. In recent times, their villages have consolidated and include permanent infrastructure such as roads, runways, and power-generating stations. Many of these communities are just a few meters above sea level and are vulnerable to storm surges and rising sea levels. 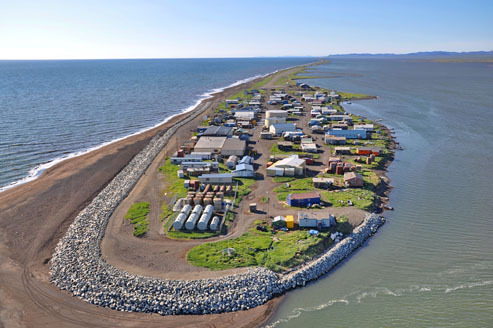 Image Credit: Alaska ShoreZone. Public domain.